When you’re a fan running on the adrenaline of the big game atmosphere in an exciting new environment, it’s easy to forget that other people – those who’ve never experienced football fans on the move – can be shocked speechless by the noise, the language, the hostility of it all. When you’re actually in the eye of the hurricane you know how much of the fury is a sham, rooted in our sense of show and irony. Everything is just a big joke to the English, but it’s a culture gap that’s hard to justify rationally to strangers. Try explaining the heritage of the English sense of humour to a couple of Australians just as 200 lads climb up on the tables to sing “There’s only one Bomber Harris” or “My grandad killed your grandad (doo dah)”. And then try and explain the drinking culture! Even drink-hardened Australian get bemused by that one. On the Metro the train carriage is predominantly full of English (many of the Germans left early). A local gets on and enquires why everyone is so quiet. “It’s just shock!” we say. He laughs. Later we pay a return visit to the Augustiner bierhalle. It’s quieter tonight. There’s a bit of singing – but no dancing on the tables, no beer-mat slinging, no sounds of breaking glass. 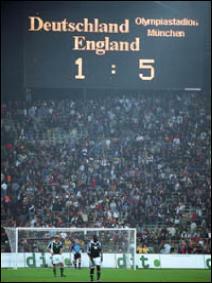 There’s a chorus of “5-1 to the Eng-ger-land”. The Germans retaliate with “We won the last game at Wembley”. It’s a great night out, football fans laughing and joking about the game they all love. Everyone is slightly shellshocked. Maybe it has just taken this result to exorcise a few of those old ghosts. Maybe the next clash won’t be as tense, as fuelled with passion. Nahhh! Can’t wait for it!